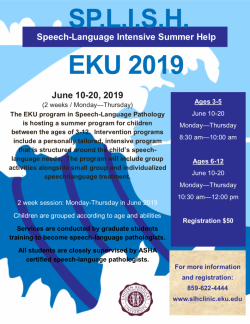 The Speech Language Intensive Summer Help (SPLISH) camp will be held June 10-20, 2019! Participants may range in age from 3-12 and will be grouped by age and disability. All participants receive individual and group speech-language therapy tailored to their individual needs. Therapy will provided by graduate students in the Communication Disorders program, under the direct supervision of licensed and certified speech-language pathologists. This camp is directed by Mrs. Robyn Wahl. For more information, please contact the Eastern Kentucky University Speech-Language-Hearing Clinic at 859-622-4444.